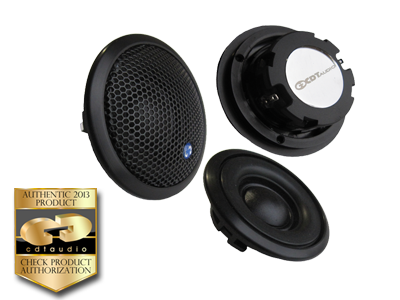 Introducing the smoothes audiophile silk dome tweeter you ever heard HD-1/BL Top high energy performance with the smoothest response. Housed in a new black anodized aluminum bezel with a special designed wide dispersion front horn housing. Wide dispersion never heard of before in a silk dome top high energy/smooth performance tweeter. The HD-1/BL silk dome tweeter driver is very airy with the smoothest power response. The silk dome is super sweet and forgiving. Your smile will stay on forever. Super power handling to match any high-end high powered installation. HD-1/BL is designed around a neodymium ferro-fluid cooled magnet structure. Frequency response 1500Hz - 21.000Hz. Impedance 4Ohm. Power handling 170Watt or even more when used with CDT designed crossovers. The HD-1/BL is a unique audiophile tweeter, specially designed with a virtually transient perfect ferromagnetic oil-cooled driver, yielding the smoothest, most gently contoured and pleasant sound. This driver is optimized for all automotive sound systems and of course integrates perfectly with other CDT components. The lucky listener is transported to sound-system heaven.